Monrovia – Liberia’s international development partners helping to remedy the country’s road network challenges have called on the government to take “critical action” in order to achieve compliance with the National Road Fund Act, NRF. The partners are the World Bank Group, the German Cooperation, European Union, African Development Bank, Embassy of Sweden and the Millennium Challenge Corporation. In a document obtained by FrontPageAfrica, the donors have underscored major issues including the transfer of already collected road funds to the escrow account, ensuring fuel importers pay their Road Fund arrears, conforming to the data-driven five-year maintenance plan and the hiring a permanent technical advisor to coordinate the NRF. The NRF was established by legislation in 2016 to finance maintenance and rehabilitation of roads and bridges. The fund comprises monies raised through appropriations by the Government of Liberia, grants, and loans by international partners, road user charges through levies on fuel and other sources. However, there have been repeated obstacles impeding the NRF including the collection of taxes from petroleum importers. Some of these delays are making international partners edgy, and they have repeated calls for a massive and robust implementation of the NRF. In the document intended to identify critical issues relating to the NRF, the six major international partners supporting Liberia’s road sector also outlined the progress of the government toward the implementation of the Road Fund Act. They mentioned the establishment of the Inter-Ministerial Steering Committee (IMSC), setting up the National Road Fund Office, reaching a legal settlement requiring fuel importers to pay to government previously collected fuel levy and authorizing the collection of the fuel levy in the 2018-19 Budget Act as some progress. They also added that the GOL began transferring funds to the NRF to match funds from the MCC compact for periodic maintenance and a Public-Private Partnership arrangement with World Bank, Liberia Reconstruction Trust Fund (LRTF) and commercial companies for the Ganta-Tappita road rehabilitation project. However, the six major international development partners are insistent that “further efforts by the GOL are urgently needed if the road fund potential is to be achieved and donor-supported initiatives sustained”. What Do The Partners Want? For the collection of funds, the partners want the government to demonstrate that it can “effectively and regularly transfer all fuel levy funds collected by LRA into the National Road Fund account,” which is an escrow account. “As of January 2019, the LRA has collected approximately US$13.2 million, but only US$8.2 million has been transferred to the NRF accounts. “Transfers are lagging two to three months behind schedule with the risk that government will be tempted to increasingly rely on the road fund levy to cover non-road related expenses,” the partners stated in the document. At the same time, fuel importers have not transferred approximately US$20 million in levy collected from customers. Therefore, the partners have urged the government to “implement a robust strategy to collect the arrears from the fuel importers and transfer those funds into the NRF account”. The partners are also worried about fuel levy being used to fill gaps in the government’s budget for other none-road activities. The partners are also recommending that fuel levy is transferred directly or with automated processes to NRF account instead of the government account and want the Ministry of Finance and Development Planning to issue an administrative order for the LRA to deposit collected fuel levy directly on NRF escrow account. At the same time, the NRF has requested for administrative accounts to avoid bottlenecks at the MFDP. The partners agreed that the NRF should establish savings and checking accounts with banking institutions for the management of the Road Fund. But the inter-ministerial steering committee (IMSC) rejected the move, arguing that “possible bottlenecks at MFDP within payment procedures should be solved” instead. 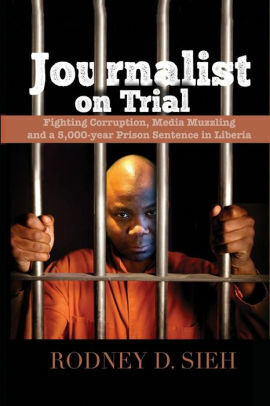 The payment of levy into the NRF has sparked serious public concern over the last couple of months and became one of four issues drawn-up for the impeachment of former Associate Justice Kabina Ja’neh, who was later adjudged by the Liberian Senate for his handling of the case at the Supreme Court. The LRA has been struggling to collect levy from importers. On November 8, 2018, the LRA communicated with the managers of Aminata & Sons, Kailondo Petroleum, and Mayoubah & Sons Incorporated, calling on them to make payments of arrears to the government. SRIMEX OIL has not made any payments of US$4.1 million the company owes in Road Fund levy, although in October 2018 the company requested a payment plan by installments. Amid all the delays, the partners say the government must consider outsourcing the collection of Road Fund levy to a debt collection agency. Commenting on budget projection for the road sector, the donors expressed concern about the extent of fuel levy withheld by importers and or the LPRC as well as the future collection of fuel levy by the LRA. They, however, suggested the preparation of scenarios for the expected budget for the next five fiscal years including donor contributions through the NRF. That projection should be split into sub-budgets for periodic maintenance, routine maintenance, spot improvements, emergency maintenance, capital projects amongst others, they noted. At the same time, the donors want national road maintenance plans to be in accordance with Legislation as well as other agreements that are compliant with the available budget. They stress that the government should explore other alternative sources of revenue that may include vehicle registration and new car purchase, amongst others. While the partners are concern about the monetary aspect of the NRF, they are also calling for a more “data-driven” plan based on performance approach “to ensure value for money and remove political bias in selection of projects”. Maintenance plans must indicate the manner in which compliance with the data-driven/ performance-based approach is achieved, they suggested. Already, the donors have supported the development of a 5-year maintenance plan that is driven by road conditions data. “The GOL must ensure that the selection of maintenance projects is data-driven and performance-based to ensure value for money and remove political bias in the selection of projects,” the donors mentioned as the main talking point. According to the Act, the Ministry of Public Works is responsible for policy, strategy, and planning while the NRF is responsible for financing and disbursement of funds. The donors suggest that once existing issues are solved or clarified, the relevant agreement should be converted into an ‘Implementation Agreement’ with the NRF recruiting a legal person to handle the legislation as well as proceed with the establishment of a Road Agency. 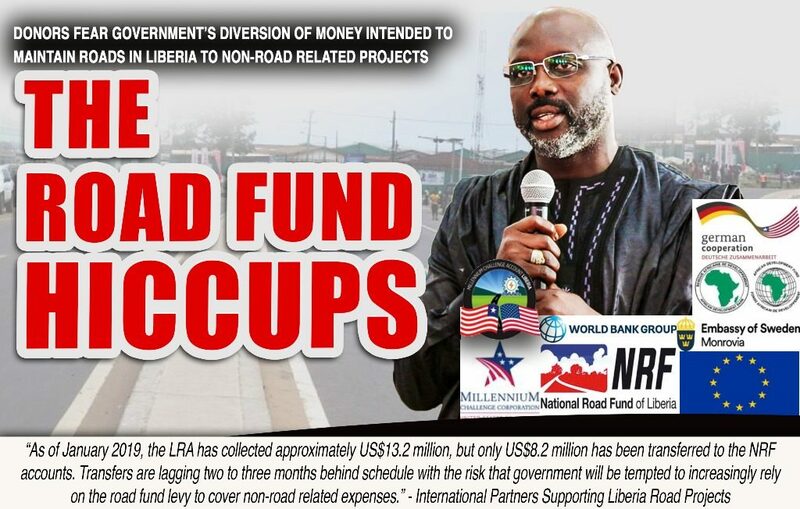 With two more years remaining for the US$257 million five-year grant to elapse, President Weah-led government risks losing over US$15 million MCC matching fund required for road maintenance. According to the MCC Liberia Compact signed in October 2015 and entered into force January 2016, the Liberian government is to providing US$7.5 million in each of the next two years as matching fund to support the country’s road maintenance project. Liberia’s road network is appalling with the number of unpaved roads in the country posing severe constraints for residents of rural communities across the country. According to the World Bank, there are a total of 734 paved roads as compare to the 9,182 unpaved roads across the country. A Work Bank survey focusing on Liberia’s financial needs estimating road classification shows that US$2.230 billion is needed to rehabilitate and or upgrade paved primary roads, while US$1.203 billion is needed to rehabilitate existing rural roads and or construct new ones. Experts say curbing the challenges of roads in the country would enhance economic revitalization including growth in food production, farm-to-market access and cut in traveling time for traders. However, the unfolding situation regarding the collection of levy and management of the NRF creates pessimism as the country’s main international donors express concerns. For example, the MCC compact states that the fund [matching fund] will remain in the United States Treasury once Liberia fails to provide its matching as stipulated in the agreement. Article 5.1(I) of the agreement, states that there shall be termination, suspension and expiration if “the Government (Liberia) fails to comply with its obligations under this Compact or any other agreement or arrangement entered into by the Government in connection with this Compact or the Program”.